Crystal Palace, geographically at least, is defined by its height: Palace = Hills. Look around up there, across the great bowl of the London basin from its southern rim and you can drink in dramatic views North towards central London, where on a clear day you can see the Shard, the towers of the City, Canary Wharf, and the iconic, reassuring dome of St Paul’s. Turn and face another direction, say from the crow haunted heights of Crystal Palace park, and you can look towards the Surrey hills. Elevation is present in the street names too, as Anerley Hill, Beulah Hill, Central Hill, Gipsy Hill, Highland Road, Sydenham Hill and Westow Hill all testify, stretching towards the Norwood Ridge and Upper Norwood. Then, in the park by Crystal Palace parade, you can see up close that unmissable landmark of South London, the Transmission Tower, standing there, like a giant dropped mapping pin, as if purpose built to provide a hard-metal focus for all this height. Famously, the iconic structure burnt down in 1936, but in and around Crystal Palace park there are traces of its former magnificence to be found. On Saturday, as part of this year’s Open House London event, I was lucky enough to get in to see one of the more mysterious and beautiful of these Crystal Palace remnants. On the western edge of the park, near the bus station, is an architectural gem, which if you’re in a car racing along Crystal Palace Parade you’d probably never know was there. Unlike most of the Crystal Palace site, this place is not high up above anything, but is hidden underground and is usually inaccessible to the public. Fortunately my wife entered a ballot and was lucky enough to win us places to visit. The Crystal Palace subway was originally the way into the Palace itself for passengers arriving at the Crystal Palace High Level railway station, which was opened in 1865. Initially intended exclusively for the use of First Class passengers, with their carriages gliding into the platform alongside its entrance, the subway made for a stunning, ornate entrance to the great glass palace it served. The station closed on the 18th September 1954, having seen a dramatic decline in use since the fiery demise of the Crystal Palace itself. The station building was demolished in 1961 and gradually began to fall into disrepair. 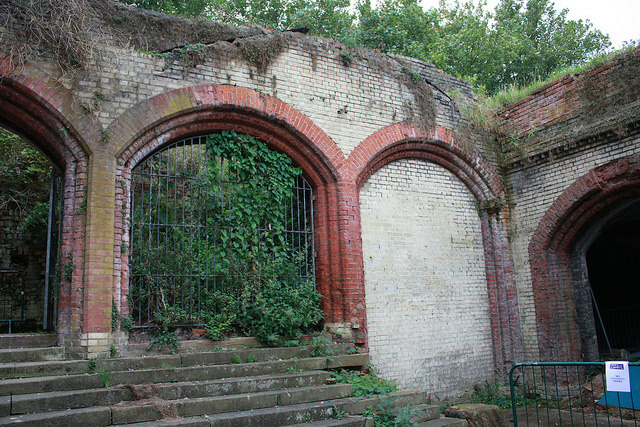 The ‘ruined’ subway was listed by English Heritage in October 1972 and bricked up later in the 1970s, opening again officially only for one day in 1979, when The Crystal Palace Foundation and the Norwood Society held a Subway Superday. Today, although gated off, dark and with some inevitable crumbling brick and stonework in parts, the subway still looks and feels a magical place. I’d seen photographs before, but to be able to stand there amidst the ornate columns and red and white brickwork was a genuinely breathtaking experience. Strangely, there seems to be no definitive record as to who actually designed the subway. Edward Middleton Barry was named as architect by the London Illustrated News when it opened in December 1865, but later published a correction stating that in fact his brother Charles Barry had been responsible. The Morning Post also credited the railway company engineer William Shelford as having been involved in the subway’s design. Confusion seems to be a theme in the subway’s history. 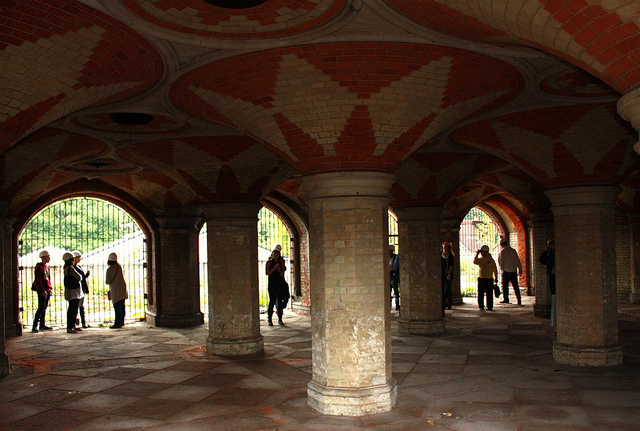 When I visited, volunteers from the Friends of Crystal Palace Subway shared the story of its construction and use, including an urban legend that had grown up, which suggested that Italian stonemasons had been brought over to craft the subway. In fact, it’s almost certainly the case that our very own Victorian builders and workers were behind it; with the misconception perhaps stemming from people hearing about the Italianate style of some of the architectural features. A 1969 lecture given to the Dulwich Society repeated the, apparently apocryphal, Italian bricklayer and stone mason angle. It is easy to see why people might have had trouble reconciling the idea of black waist-coated, roll-sleeved 19th century English brickies with the creation of something quite so gorgeously elaborate. But then this building belongs to the era of Gilbert Scott’s Midland Grand Hotel at St Pancras, Manchester Town Hall and the Templeton’s Carpet Factory in Glasgow. Whatever the truth behind its design and construction, the subway remains an awe-inspiring place. Rather than building functional ticket-hall and underground walkway, the Victorians gave us a strikingly exotic structure, a palace beneath a palace, that seems closer to the Medina Azahara in Cordoba, than Sydenham Hill. A space that has been hidden, blocked-off and half-forgotten for decades and yet, fantastically, is still largely intact, as it awaits the next chapter of its history, behind a set of locked iron gates, beneath a busy stretch of the A212. This is gorgeous! I had no idea it was there. Beautiful pillars. Almost as impressibe as the original mosque in Cordoba and cheaper to get to. More accessible from Bristol but less accessible to the general public. Which is a shame really as it would save on air travel and its’ accompanying pollution. Perhaps it is better if it is closed and not subject to the pollution of London.